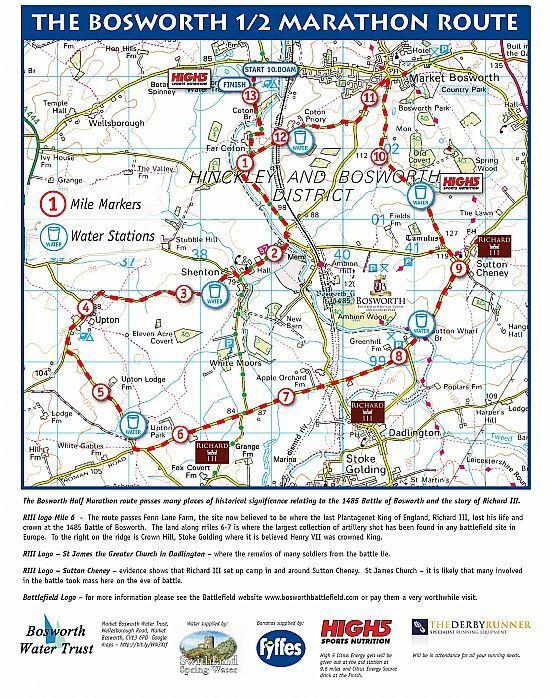 Pleas follow the instructions of the race officials & marshalls at all time whilst on the course. No MP3 players or headphones are allowed whilst running. 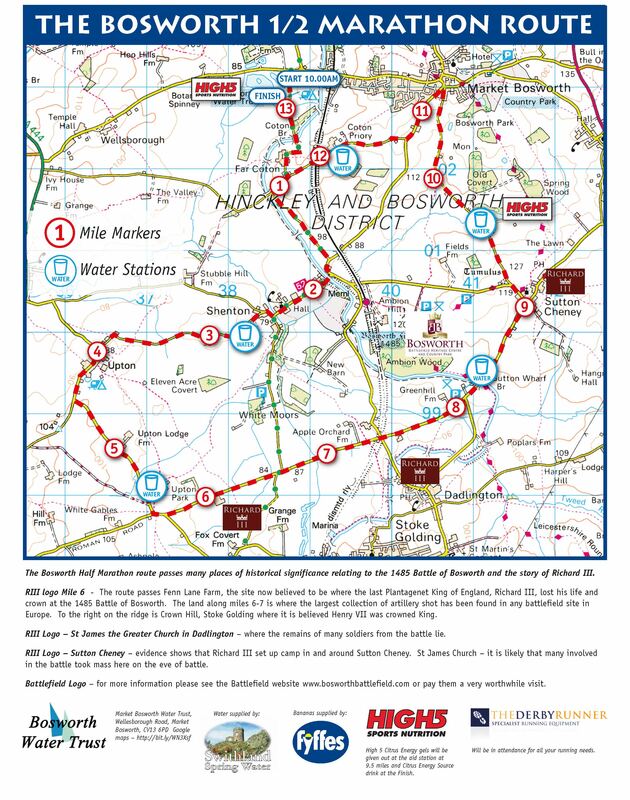 PLEASE COME AND JOIN US FOR THE 2019 BOSWORTH HALF MARATHON. EVIDENCE SHOWS THAT THE SITE OF THE 1485 BATTLE OF BOSWORTH IS NOW ON FARMLAND ALONG THE FENN LANES WHICH YOU WILL RUN ALONG FROM 5.75 MILES TO 9 MILES AT SUTTON CHENEY. WITH RICHARD III'S REMAINS BEING FOUND UNDERNEATH A CAR PARK IN LEICESTER IN 2012 AND HIS PROCESSION FROM FENN LANE FARM ON SUNDAY 22ND MARCH 2015 TO HIS REINTERMENT ON 26TH MARCH IN LEICESTER CATHEDRAL, THIS AREA HAS BEEN OF HUGE HISTORICAL INTEREST. THE FINDING OF THE SILVER GILDED BOAR ON THE FENN LANE FARM FIELDS (AT MILE 6) STRONGLY INDICATE THAT RICHARD III LOST HIS LIFE AND HIS CROWN ON THIS SITE. THE LARGEST FIND OF ARTILLERY SHOT ON ANY BATTLEFIELD IN EUROPE WAS ALSO FOUND IN THIS AREA. THIS WAS THE FIRST TIME ARTILLERY WAS USED IN ANY BATTLE AND THEREFORE THIS AREA IS OF HUGE HISTORICAL INTEREST. AS YOU LOOK TO THE RIGHT HERE, THE RIDGE YOU SEE WAS WHERE SIR STANLEY'S ARMY WERE GATHERED BEFORE JOINING HENRY IN BATTLE. YOU CAN ALSO SEE THE SPIRE OF ST MARGARET'S CHURCH STOKE GOLDING. CLOSE BY IS CROWN HILL WHERE HENRY VII WAS UNOFFICIALY CROWNED THE NEW KING OF ENGLAND. A VISIT TO ST MARGARET'S WILL SHOW STONES WHERE SWORDS WERE SHARPENED BEFORE BATTLE. AS YOU PASS FURTHER ALONG FENN LANE, THERE IS A NOW PRIVATE AIRFIELD TO THE RIGHT. THIS IS THE LIKELY SITE OF RICHARD III'S ARTILLERY AS THE LAND IS SLIGHTLY HIGHER. GUNS COULD FIRE UP TO 1200 METRES AND HENCE WHY THE MOST SIGNIFICANT FINDINGS OF SHOT WERE FOUND AROUND FENN LANE FARM. AT THE DADLINGTON CROSSROADS, LOOK UP THE LANE TO THE RIGHT TO SEE ST JAMES THE GREATER CHURCH. IT IS KNOWN THAT THE REMAINS OF MANY SOLDIERS FROM THE BATTLE WERE LAID TO REST HERE. A VISIT TO THIS LOVELY CHURCH IS RECOMMENDED - YOU CAN SEE COPIES OF HENRY VIII'S AUTHORISATION FOR A CHANCERY HANGING HERE. AT MILE 9 IS SUTTON CHENEY. AGAIN THERE IS EVIDENCE THAT RICHARD III'S ARMY OF 12,000 SOLDIERS CAMPED IN AND AROUND THIS HAMLET ON THE EVE OF THE BATTLE. MANY WOULD HAVE RECEIVED MASS AT ST JAMES' CHURCH - LEGEND HAS IT THAT RICHARD HIMSELF DID TOO. AGAIN A VISIT TO THIS BEAUTIFUL CHURCH IS HIGHLY RECOMMENDED. TO ENHANCE YOUR VISIT, WE WOULD ALSO RECOMMEND A VISIT TO BOSWORTH BATTLEFIELD HERITAGE CENTRE AND COUNTRY PARK www.bosworthbattlefieldcom. THE VISITOR CENTRE ATTRACTED WORLDWIDE INTEREST WHEN RICHARD III'S CORTEGE ARRIVED ON 22ND MARCH FOR A SPECIAL CEREMONY LED BY THE BISHOP OF LEICESTER, THE RT REVD TIM STEVENS. 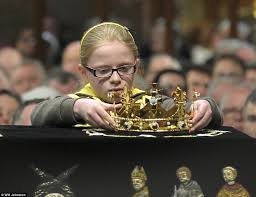 THE PLACING OF THE CROWN ON THE COFFIN OF RICHARD III AT LEICESTER CATHEDRAL BY EMMA, THE DAUGHTER OF LEICESTERSHIRE RUNNER MARK CHAMBERLAIN. THERE IS NO DOUBT THAT BOSWORTH AND LEICESTER ARE THE FOCUS OF HUGE INTEREST FOR THE RICHARD III STORY BOTH IN THIS COUNTRY AND WORLDWIDE AT PRESENT.